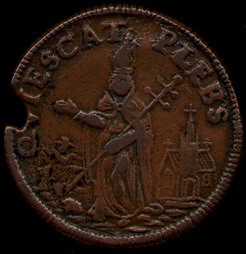 Section 1 - Obverse punctuation of :REX: and small steeple reverse (notes the first three examples have an unusual letter punch for F and E in FLOREAT). Comments: This example shows most of the features mentioned in the method of organization section as usual, with a rather large brass flasher. 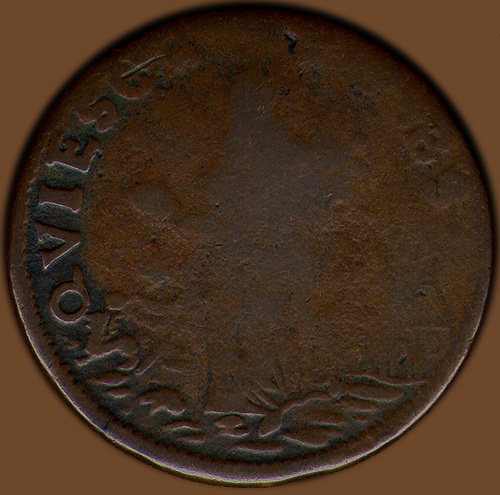 These is also an unusually large rim planchet void (made before the coin was struck) at 9:00 o'clock in this well preserved specimen. 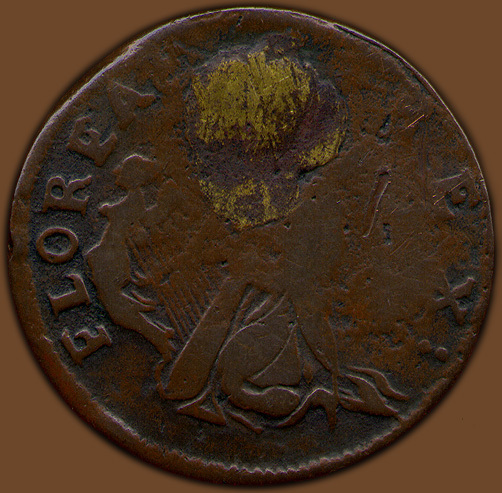 On the obverse note that the cross strokes on the F and E in FLOREAT have serifs pointing upwards. 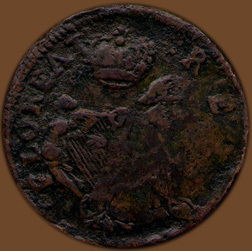 These unusual punches were also used on the dies for the following two examples. 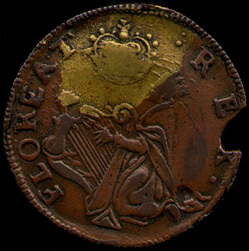 The bow on the harp is close to the O in FLOREAT and the head of the harp is aligned with the E. The spikes on David's crown go from the vertical of the R to the space between the R and the E. Also, the top stop of the first colon is smaller and the top stop of the final colon is into the rim. 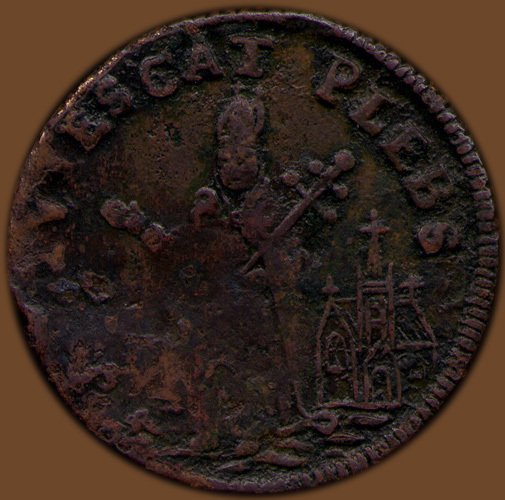 On the reverse the two small crosses atop Patrick's miter are very close to the T. Patrick's staff points between the L and E in PLEBS. 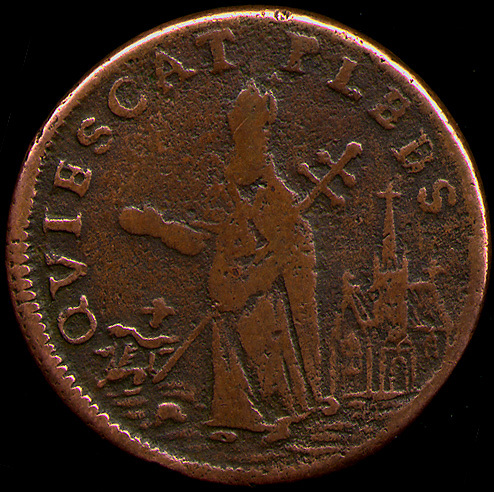 On the church steeple the horizontal bar of the cross is aligned with the upper side of the S.
Provenance: From the Robert H. Gore, Jr. Numismatic Collection. 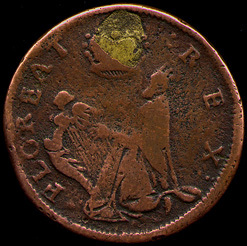 This is one a group of St Patrick copper Mr. Gore obtained from William Anton, Jr., President of Woodcliff Investment Corporation on August 9, 1967. 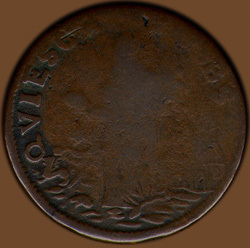 According to Anton's letter the coins were duplicates from the F.C.C. Boyd collection. Comments: On the obverse note that the cross strokes on the F and E in FLOREAT have serifs pointing upwards. These unusual punches were also used on the dies for the previous and following examples. 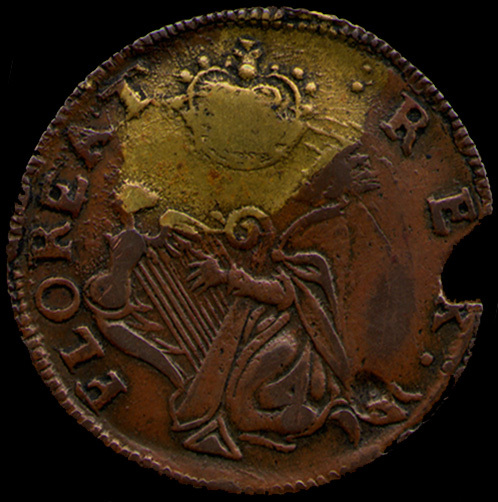 The bow of the harp is at the L and the head is aligned with the R in FLOREAT. The spikes on David's crown are difficult to distinguish but is appears the go from the vertical of the R to the space between the R and the E. On the reverse Patrick's hand points to between the V and the I. The two small crosses atop Patrick's miter are directly below the vertical stroke of the T. His staff points to the serif of the L in PLEBS. 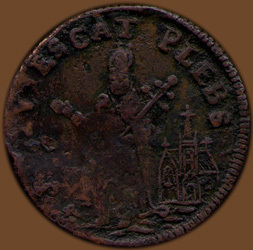 On the church steeple the horizontal bar of the cross is at the upper side of the S.
Comments: On the obverse note that the cross strokes on the F and E in FLOREAT have serifs pointing upwards. These unusual punches were also used on the dies for the previous two examples. The bow on the harp appears to be at the O in FLOREAT and the head is aligned with the vertical of the E. On the reverse a griffen touches the Q, susually this figure is further down. Patrick's outstretched hand points to between the I and the E. The other areas are too worn. 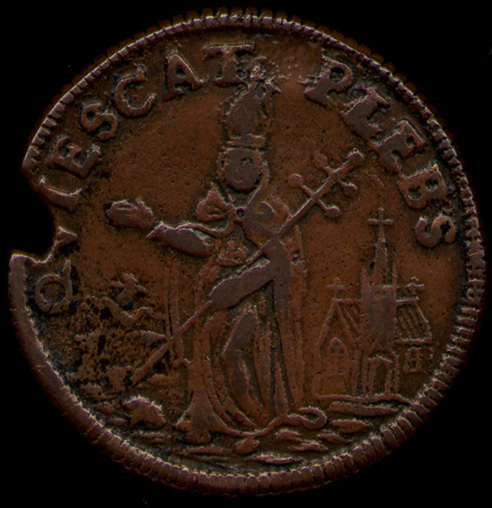 What appears to be a snake on the ground to the left of Patrick is simply a worn cloak hem and Patrick's left foot (compare to the first example above). 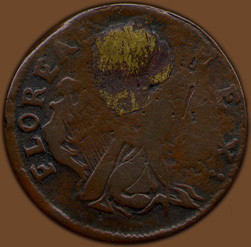 Comments: On the obverse it appears there may be a period before FLOREAT but it could just be a wear spot or a planchet defect. The bottom of the figurehead on the hard bows out at the O and the head is aligned with the E in FLOREAT. 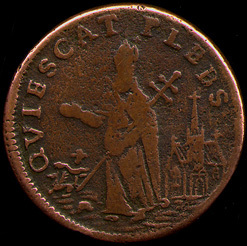 On David's crown the first spike points to before the R the others seem to point at the R. On the reverse the two small crosses atop Patrick's miter are spaced apart with the bact cross very near the P. His staff points towards the center of the bottom horizontal stroke on the E in PLEBS. On the church steeple the horizontal bar of the cross points at the upper side of the S.